A male Bobolink sings from atop a fencepost in the Red Clay Valley, May 18, 2011. Image by Derek Stoner. Today I observed a flock of about 6 male Bobolinks ( brilliant black with gold and white accents) and 45 females (mostly a buff-yellow color with brown streaks) feeding in a hayfield along Barley Mill Road. Flocks of Bobolinks pass through Delaware in the month of May as they head north to their breeding grounds. The First State is not currently known to have any breeding populations of Bobolinks, but with efforts underway to increase healthy grassland habitat, there may be a possibility in the future that we can enjoy their fantastic songs all summer long! The chattering song of male Bobolinks rose up from the hayfield, sounding like a convention of characters from old Star Wars movies. Often-described as sounding like R2-D2, these colorful members of the blackbird family like to feed and nest in hayfields and pastures. Males perched on fenceposts or treetops and broadcast their incredible song that is a mish-mash of gurgles, chirps, squawks, and warbles. 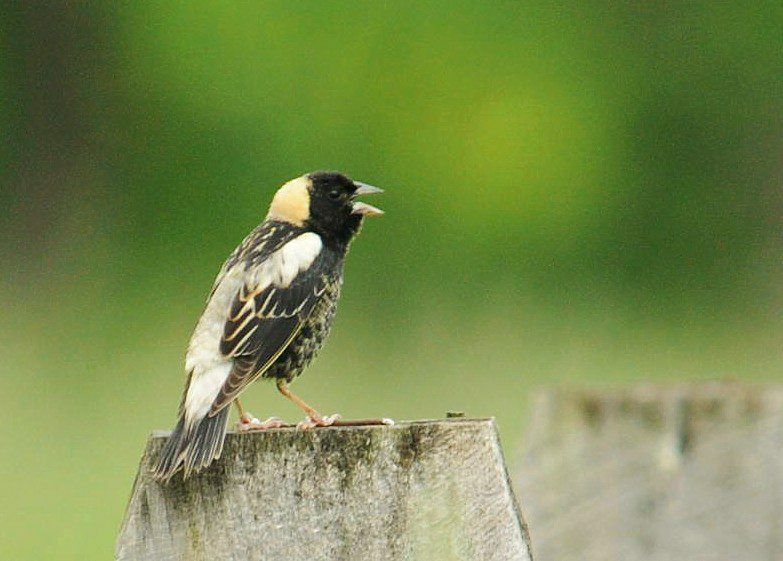 Check out a great video of Bobolink singing to hear their impressive song. Every Sunday and Monday at 8am, the Delaware Nature Society runs free bird walks at the Bucktoe Creek Preserve. I led the walk this Monday, and we didn’t have to go far to see birds. What is known as the Sharp Road Field was recently hayed, but several large patches of standing grass and milkweed were left for cover and food for wildlife. We circled these patches to find migratory sparrows and ended up seeing a wide variety of birds, including some rare species. Enjoy the photos by Hank Davis to give you a glimpse of what we saw yesterday morning. Attend a bird walk at privately-owned Bucktoe Creek Preserve sometime in the future. 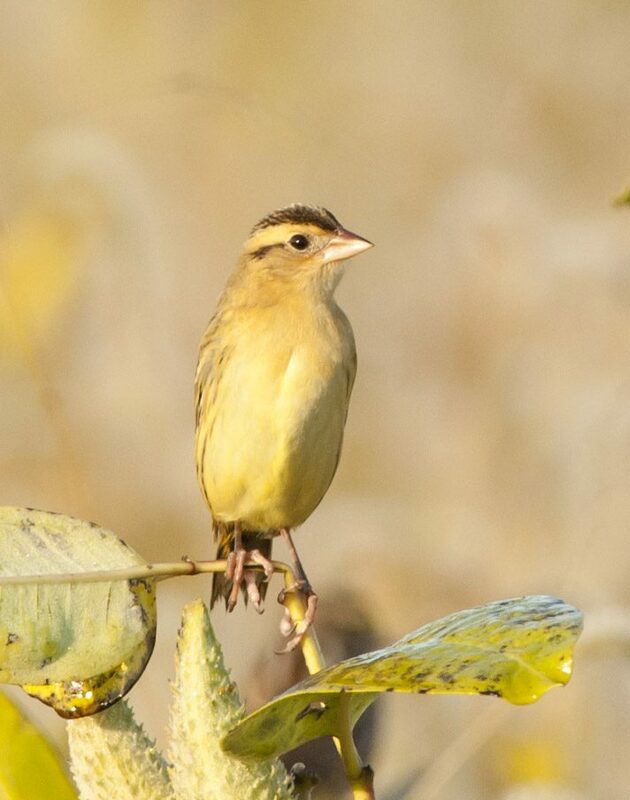 I was very surprised to see a Bobolink this late in the season. These meadow-loving members of the Blackbird family have usually migrated out of our region by mid-October. This individual, late by a few weeks, is on its way to South American grasslands for the winter. Savannah Sparrows were abundant in the meadow. They perched up in the morning sun and allowed a close approach. 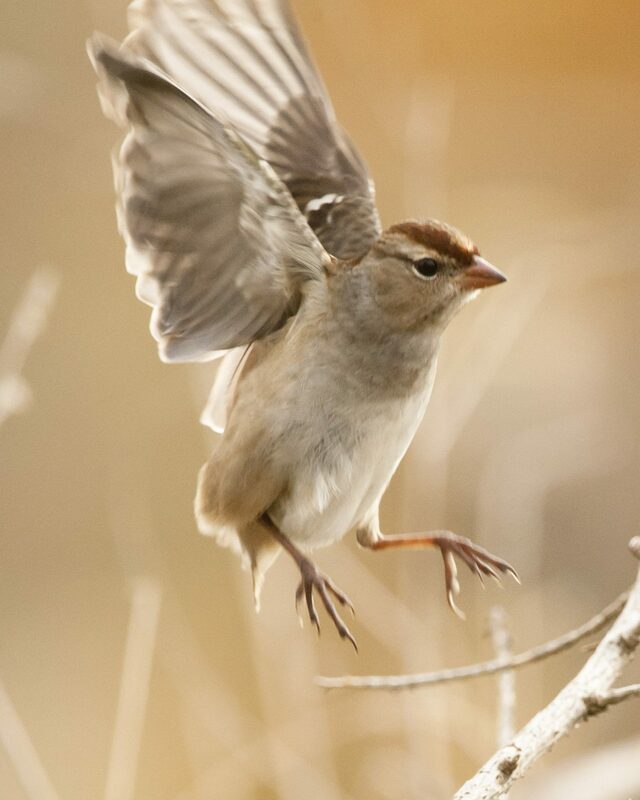 These sparrows are migrating through our area now in substantial numbers. This juvenile White-crowned Sparrow was one of six found on our walk. They usually occur in thickets and hedgerows at this time of year as they pause on their way south. A few overwinter in our area, but most winter further south. The bird of the morning was a single Vesper Sparrow. 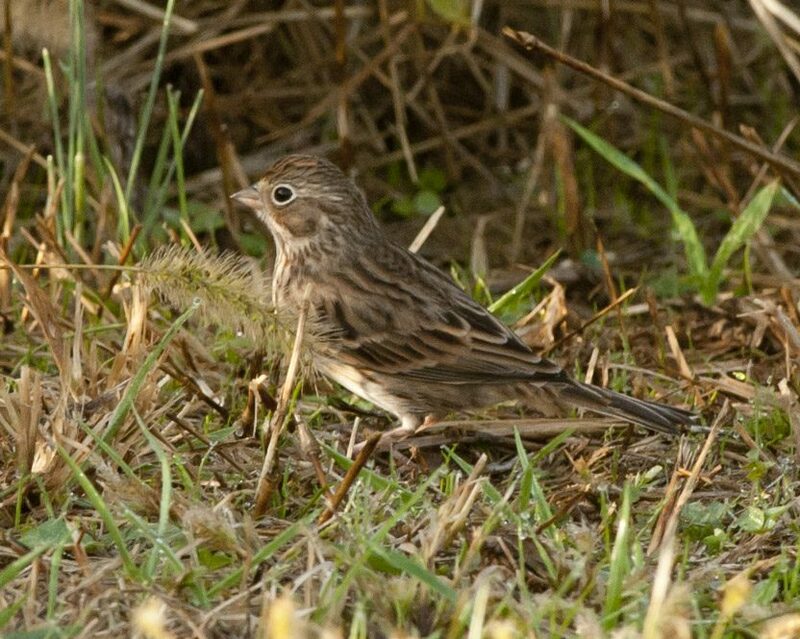 This meadow species is very difficult to find in migration. Birders that spend many hours searching for them in migration don't see them every year. 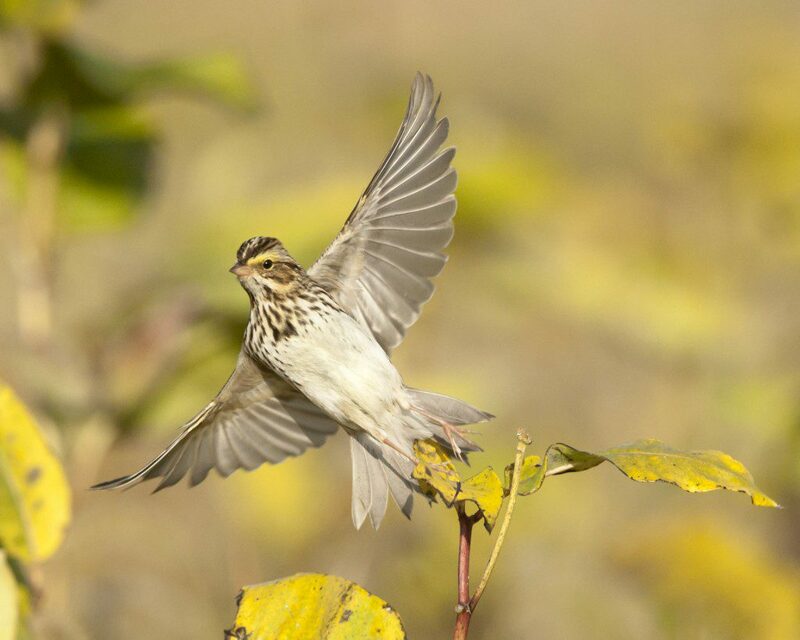 Although superficially similar to a Savannah Sparrow, the Vesper has a bold eye-ring and a different facial pattern. We also saw the white outer tail feathers when it flew.